Another week has passed in the presidential race and it appears that Donald Trump is not making up much if any ground on Hillary Clinton. Last month, we coined the term “Fortress Obama” to describe an outer and inner ring of defenses Clinton had against Trump as she sought to recreate Barack Obama’s Electoral College majority. The outer ring consisted of states like Florida, Iowa, Nevada, and Ohio — states that Obama won twice but that are vulnerable to Trump — as well as North Carolina, which Obama carried only in 2008. These are states that Trump needs but that Clinton could probably do without. Then there’s the inner ring, states like Colorado, New Hampshire, Pennsylvania, Virginia, and Wisconsin, none of which Clinton can afford to lose if Trump were to completely knock down the outer ring. At this point, Clinton is no worse than 50-50 to carry each of the outer ring states — even states like Iowa and Ohio, where polls have been very close or even show a Trump edge — and she seems secure in all of the inner ring states. This is why Clinton is such a heavy favorite to win the presidency, and our ratings changes this week make her an even slightly bigger favorite. The fact that early voting has started in earnest in many of critical states also limits Trump’s comeback potential: Even if some major late development causes the polls to tighten, many millions of votes will have already been cast. This week, we’re not altering our topline Electoral College projection. We have 352 electoral votes — 82 more than the 270 required — at least leaning to Hillary Clinton, 173 at least leaning to Donald Trump, and 13 electoral votes worth of Toss-ups: Iowa, Utah, and the single electoral vote in Maine’s Second Congressional District. But we are strengthening the map for Clinton by pushing two Leans Democratic states — New Hampshire, and Wisconsin — to Likely Democratic. 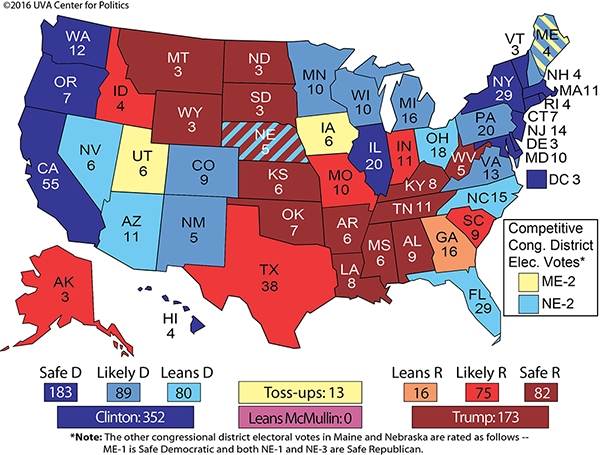 That moves Clinton to 272 electoral votes that are rated at least likely for her, matching the highest total we’ve had for her this cycle (we had 272 electoral votes at least likely for her before her September campaign downturn, in advance of her recovery during the first debate). While New Hampshire and Wisconsin are, on paper, states where Trump should be very competitive — both states are much whiter than the national average — Trump has not led a single poll in either state, according to the RealClearPolitics averages. The Clinton campaign has always appeared very confident in Wisconsin — the candidate herself has not even visited the state during the general election period, a sign that the campaign does not feel vulnerable there — and public polling averages in both states shows Clinton with a lead of half a dozen points or more. 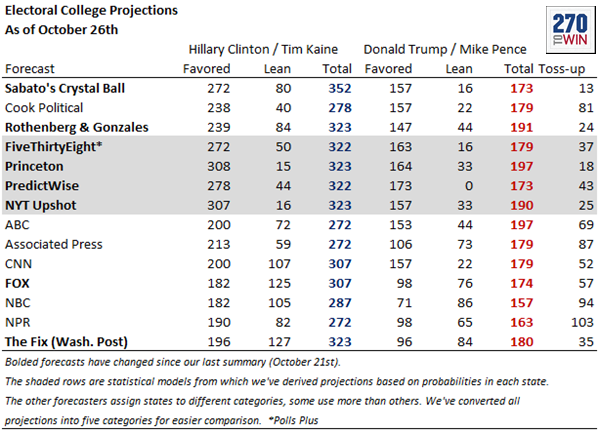 — The Crystal Ball actually has the largest projected electoral vote total of any of the major prognosticators. Our friends over at 270toWin.com, a wonderful site where you can make your own electoral maps, have been tracking other projections. 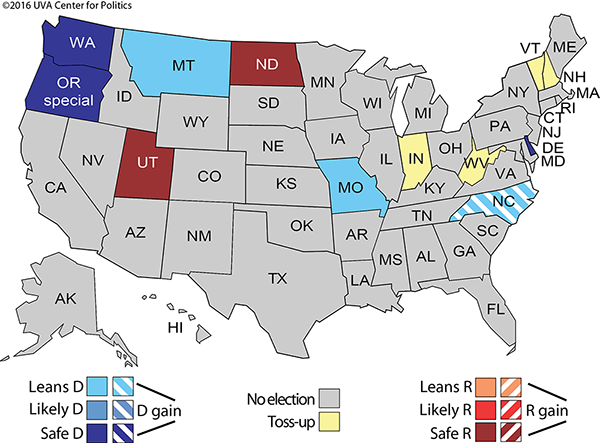 While all of the analysts have Clinton clear of 270 electoral votes, we’re the highest at 352 (these projections are as of Wednesday morning but they include our changes in the Granite and Badger states). — Libertarian Gary Johnson appears to be fading, as is common for third-party candidates. He was at about 9% in national polling averages as of mid-September, but now he’s at about 6%. It seems possible, perhaps even likely, that he’ll finish below 5% of the vote. That’s meaningful because if Johnson gets 5% or more, the Federal Election Commission would classify the Libertarians as a “minor party,” making the party eligible for federal matching funds in the 2020 presidential race (the small-government party would then have to decide whether it could be faithful to its principles yet still accept such funds). Meanwhile, it appears that Johnson’s drop has benefited Clinton more than Trump. In the RealClearPolitics national four-way polling average, Clinton was up 42%-40% on Trump as of Sept. 14, with Johnson at 9%. Now, Clinton is up 46%-40%, with Johnson at 6%. So as Johnson has fallen three points, Clinton has gained four points while Trump is in about the same position (Green Party nominee Jill Stein dropped from 2.7% to 2.0% in this timeframe, which probably also has marginally helped Clinton). It is not possible to say flatly that these voters migrated from Johnson to Clinton (they could have come from the undecided column or even Trump’s), but surely Johnson’s ex-supporters account for some of Clinton’s gains. — While it still seems as though the presidential winner will not win a popular vote majority (50%+1), it’s possible that if third-party support erodes further, Clinton might have a chance to get there. If so, she’d accomplish something her husband never did. While Bill Clinton won more electoral votes (370 and 379 in 1992 and 1996, respectively) than Obama won in his two elections, he never won a majority of the national popular vote as Obama did twice. That was because of the third-party candidacy of Ross Perot, who attracted a remarkable 19% and 8% of the vote, respectively, in 1992 and 1996. — On balance, early voting appears to be benefiting Democrats in states like Colorado, Florida, and Nevada, among others. For more on these states, see informative recent reports from Politico’s Marc Caputo in Florida, KTNV’s Jon Ralston in Nevada, and the Denver Post’s John Frank. Prof. Michael McDonald of the University of Florida does about as good of a job as anyone tracking this across the nation, so see his Twitter feed for updates. Iowa and Ohio, two Midwest swing states that are demographically favorable to Trump, seem to be lagging for Democrats this year, although in the case of Ohio it’s hard to say that with finality. Beware any reporting on Ohio that cites party ID of early voters: Party registration in the state is malleable, as voters can switch between parties depending on which party ballot they take in the primary. Republican turnout was much heavier in the March presidential primary, and while some Democrats who took ballots to vote for Trump will probably stick with him in the fall, there are potentially many Clinton voters who are technically “Republicans” because they voted in the GOP primary for favorite son Gov. John Kasich and others. McDonald has noted that ballot requests are down from 2012 in some big, Democratic counties in Ohio, which is a legitimate concern for Democrats, particularly because black turnout may be down. But it’s also possible that Ohio early voting will be a little back-loaded this time: Early voting started later than in 2012, and this year features two full weekends of in-person early voting (this weekend and next weekend), while 2012 featured only one. In any event, “Election Day” is an antiquated concept in many states, and perhaps as much as 40% of all votes will be cast before Tuesday, Nov. 8. — While we’re keeping Utah as a Toss-up, we are actually starting to like independent conservative Evan McMullin’s chances in the Beehive State. Do we know this for sure? No, we do not. But McMullin has the momentum in Utah, he’s campaigning hard, and many members of the LDS Church have embraced him as a welcome alternative to Trump and Clinton. As a Mormon, BYU graduate, and traditional conservative, McMullin is positioned to grow his support. Our six Toss-ups all remain in that category, although we believe it’s ultimately going to be hard to pick incumbent Sens. Kelly Ayotte (R-NH) and Pat Toomey (R-PA), as well as Rep. Joe Heck (R) running for an open seat in Nevada, whatever the polls say (and the polls have been all over the place in these races). All of these candidates have crossover appeal, but Clinton’s coattails could doom them. Races in Indiana, Missouri, and North Carolina are even harder to figure. Of the three, the Democrats’ best chance might be in Indiana, an open seat where former Sen. Evan Bayh (D) probably still retains a small lead despite being damaged by controversies concerning his lucrative post-Senate career and his shaky claims to current residency in the Hoosier State. Sens. Roy Blunt (R-MO) and Richard Burr (R-NC) are likely harder targets, but challengers Jason Kander (D) and Deborah Ross (D), respectively, have effectively tied both contests. Democrats also retain hopes of an upset against Sen. Marco Rubio (R-FL) in a Leans Republican race; Rubio’s lead against Patrick Murphy (D) has narrowed, and Clinton’s strong apparent showing might be helping Murphy in parts of Florida. However, the decision by outside Democratic groups to not spend on Murphy’s behalf is causing internal divisions within the party. As is our longtime tradition, we’ll make a call in all of these Senate races before the election. There has not been a great deal of change in the House since our update last week. Democrats are still up only by about four or five points in the House generic ballot averages. The kind of wave they need to net 30 seats probably requires a polling lead of about 10 points or so. Our projection of a Democratic gain of around 10-15 seats is still our best judgment at the moment, with the higher end being likelier at this point. However, Republicans remain solid favorites to hold their majority. We have a handful of changes this week. The most significant is in NV-3, where we now see former synagogue leader Jacky Rosen (D) as a small favorite against frequent candidate Danny Tarkanian (R). The same factors helping Clinton in early voting also help Rosen in this swing seat. Both parties have produced dueling internal polls showing their respective candidates ahead, but Rosen may be better positioned in an evenly-divided district where Trump seems likely to underperform Mitt Romney’s 2012 showing. A couple of other Republican-held seats are getting more competitive. Outside groups representing both parties are now investing in CA-21, a heavily Hispanic seat held by Rep. David Valadao (R), as well as IN-9, an open, Republican-leaning blue-collar district where the Republican candidate, businessman Trey Hollingsworth, is being dogged by questions about his connection to the district (he is from Tennessee and only moved to Indiana recently). Both move from Likely Republican to Leans Republican. Meanwhile, we still have 16 Toss-ups, and it’s not obvious at this point that they are uniformly breaking one way or the other. 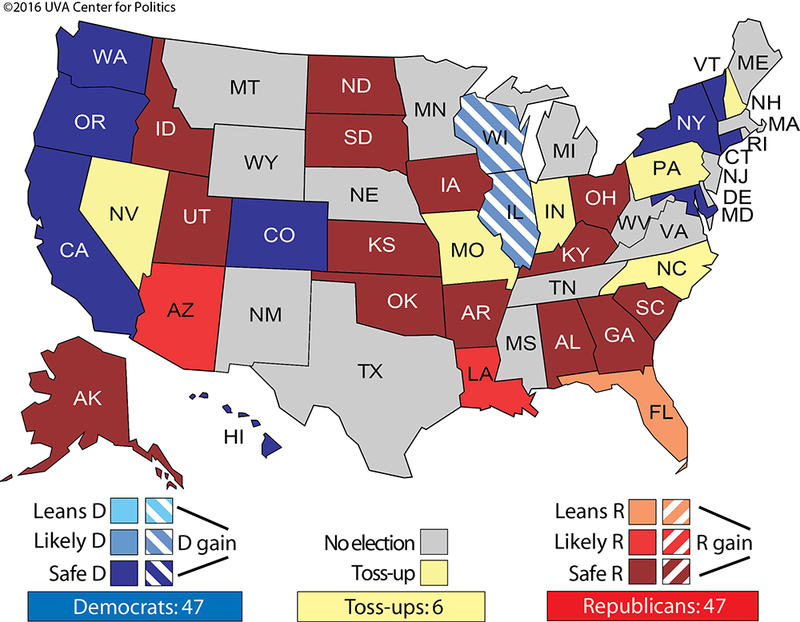 The remaining four Toss-ups are all hard calls: open seats in Indiana, New Hampshire, Vermont, and West Virginia. Arguably, the Democrats may have a tiny edge in all of these states except for, incredibly, very Democratic Vermont, where Lt. Gov. Phil Scott (R) seems well-positioned. Polling also shows businessman Jim Justice (D), the richest man in West Virginia, leading in the race for that governorship despite the possibility that the state could give Trump his biggest victory in any state. So we could have some odd results with considerable ticket-splitting in those and other states this year — but we’re not quite ready to make picks in these four races. Get ready for a wild finish in Campaign 2016’s last dozen days. In this crazy election, the only thing we can rule out for sure is a quiet ride to Election Day.